Windows Sharepoint services is a technology that offers an integrated environment of collaboration and communication services. Sharepoint is one of the best platform for developing web-based business application and website. 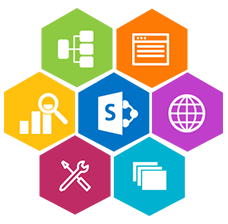 We can migrate previous Microsoft sharepoint versions into Microsoft sharepoint server and sharepoint online services. We can fully map out sharepoint development is reduced the time and attempt required migration for wide data. We can develop scalable applications. It is allows you to add applications and features manually. Collaborative application throughout you can share your ideas, documents, and other assets. Content driven application development along with you can create and publish content. Why sharepoint development with us ? Axis Technolabs has deployed implementations of sharepoint server as an enterprise CMS. Our sharepoint development team has a wide experience in this tool and technology. You can come with your fresh ideas for developing sharepoint applications with the Axistechnolabs.